MetalRockNews: Megadeth's David Ellefson: "Songs on 'Dystopia" have same spirit we had in the very beginning"
Megadeth's David Ellefson: "Songs on 'Dystopia" have same spirit we had in the very beginning"
Megadeth bassist David Ellefson was recently interviewed by Sandusky Register, you can read some excerpts below. 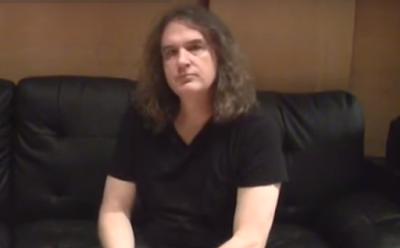 About how the process of making Megadeth's album, "Dystopia", was different to how some of the band's earlier efforts were made, Ellefson said: "You know, the 'Dystopia' album is probably... People use these clichés: 'return to form,' 'back to its roots'... You know, you never go backwards; you only go forwards. But you do, in some ways, come full circle, I think, maybe to the degree that this record… I mean, I think the production is phenomenal. The songs, I think, have a spirit in them that is reflected probably back to the same spirit we had in the very beginning, which is we really stripped away record-company influence, management influence — any outside influence — and really… Dave Mustaine, of course, is the chief songwriter of Megadeth, and there were times when he and I were sitting together working on things. So [there we were], back to me and Dave sitting in a room working on songs together. So I could feel it even inside the band, that there were some moments on 'Dystopia' that really felt like it was back in the very beginning when it was really just down to the members of the group creating and recording and putting the music together."